String Light is a lamp of a different kind. The extra-long cable and the innovative concept of the pendant lamp with the conical head from Flos enables architectural and newish light solutions for private and public rooms. 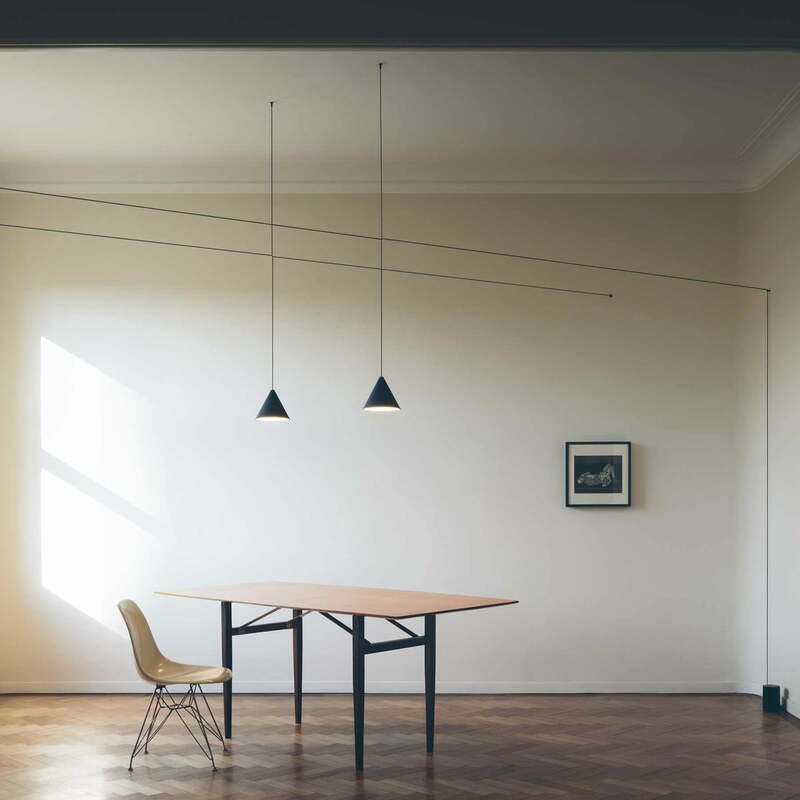 The designer Michael Anastassiades explains that he was inspired by three things when he designed the Flos String Light: ”While I’m travelling, I always see the electricity cables which connect power poles from the trains’ windows. And while the train moved fast, I looked at those completely parallel poles and found myself attracted by that incredible discipline and asking myself how that could be possible? It is simply beautiful how power poles are connected and how they equally divide a landscape. I wanted to transmit that vision into my private surroundings. I like how people use the light to divide rooms, especially outside. Only think of a nocturne village square near the Mediterranean sea. The people there have fairy lights hanging in a square of four poles. It would be as if they said: “The party is right here.” Those lights mark the place of an activity. And the last reason, which is as well the most practical one, is the one of how lamps are moved from one place to another, if the power connection isn’t where one needs it. So how is it possible to place a lamp where it looks the best without an effort? 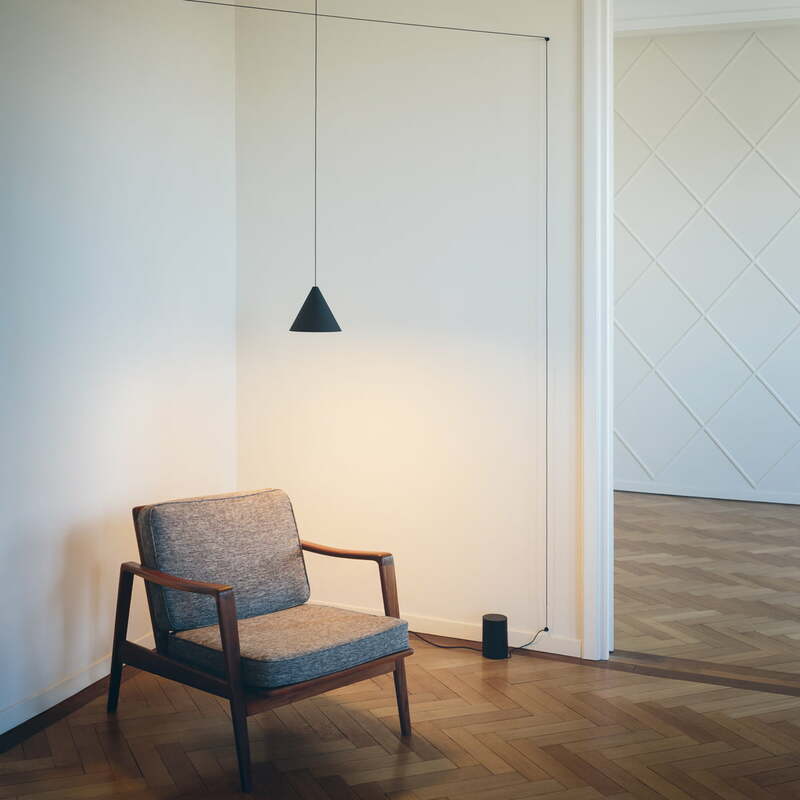 Equipped with a cable of 12 meters, the Flos String Light pendant enables geometric patterns in every room. Rooms get new architectonic dimensions. If needed, the cables can be re-organized in order to enable different feelings in the room: patterns of clear linearity up to abstract art are possible. 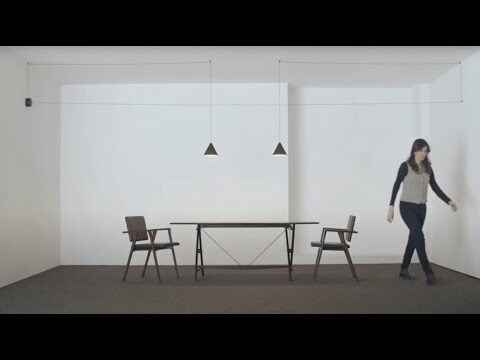 The newish concept of the Flos String light is as well very practical: To hang the lamp is possible without available connections in the ceiling. If needed, the lamp can be re-designed again and again to be used differently. The Flos String Light with the spherical head has some technical advantages as well: The diffuse light can be switched on and off by means of a Touch Sensor in the lamp’s head and it is also step-less dimmable. The energy saving LED illuminant enables warm white light for a pleasant ambience with 2700 K.
The String Light combination possibilities are nearly endless because of the available all-including accessories. Examples and suggestions for different installations are also included in the delivery, including some Blanc showrooms to draw your personal configuration in. The coaxial cable of the aluminium die-casting made lamp is reinforced with Kevlar. The geometrical lamp from Flos is also available as String Light spherical head. Both editions are also available with a 22 meters cable. Wall brackets kit with 5 fixation points. Additional connection cable to comply individual configurations. Wall or ceiling canopy for the installation of max. 2 lamp heads with 3 cable outcome possibilities. Floor switch for the installation of max. 2 heads with 2 cable outcome possibilities. Inside compartment with enough space for 10 metres of cable. Booklet incl. numerous inspirations and examples of suspension. Details on/off switch is electronic with optical mechanism. on/off and dimmer operated by means of Bluetooth Android and Apple remote control application. Thanks Connox - delivery was lightning fast and the light is perfect.